311th C.T.D. 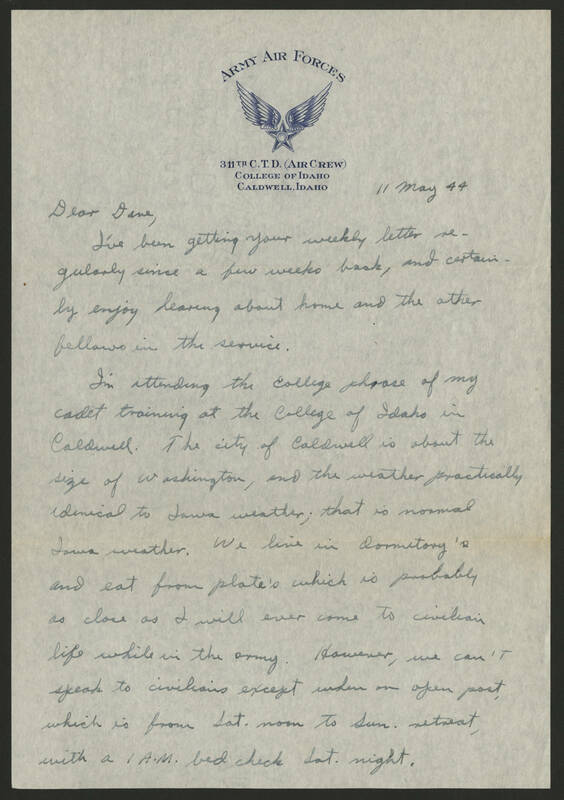 (Air Crew) College of Idaho Caldwell, Idaho 11 May 44 Dear Dave, I've been getting your weekly letter regularly since a few weeks back, and certainly enjoy hearing about home and the other fellows in the service. I'm attending the college phase of my cadet training at the College of Idaho in Caldwell. The city of Caldwell is about the size of Washington, and the weather practically identical to Iowa weather; that is normal Iowa weather. We live in dormitory's and eat from plate's which is probably as close as I will ever come to civilian life while in the army. However, we can't speak to civilians except when on open post, which is from Sat. noon to Sun. retreat, with a 1 A.M. bed check Sat. night.